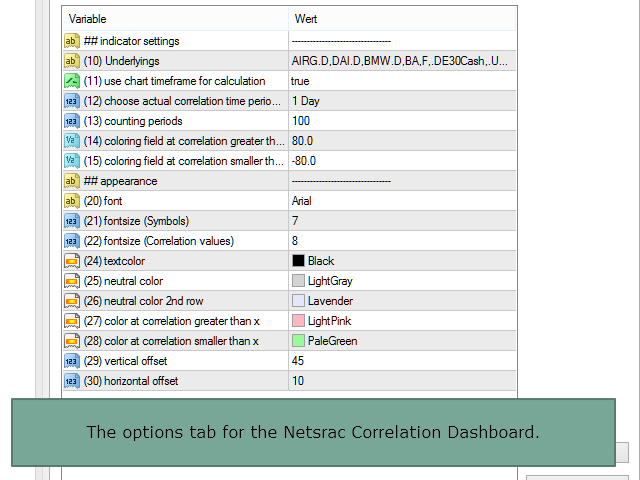 The dashboard helps to get a quick overview of the correlations of different underlyings to each other. For this, the value series are compared according to the Pearson method. The result is the value of the correlation (in percent). There are different methods for the correlation. In the so-called carry trade, an underlying is bought. A highly negatively correlated pair is sold. The respective swaps play an essential role in this method. Another method is to hedge positions. 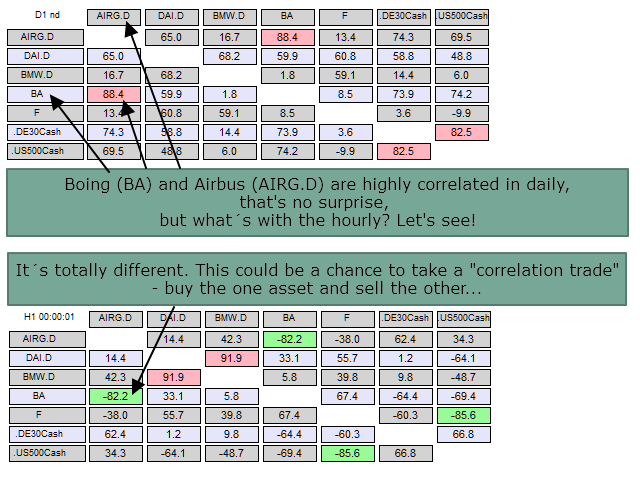 A position should be hedged by buying or selling a correlated pair. 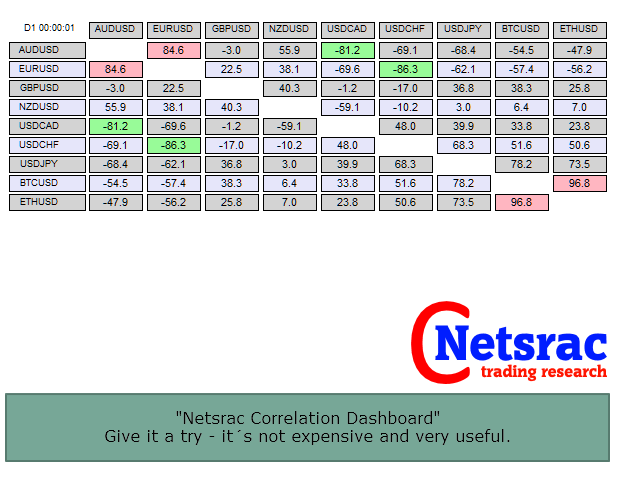 The calculated values of the correlation are displayed in the matrix. Values from -100% (absolutely negative correlation) to 100% (absolutely positive correlation) can be displayed. If a (!) Is displayed after the value, the number of bars is smaller than the set number of periods. If there are less than three bars for the underlying, no correlation is calculated. Then an "X" is displayed. A list of underlyings separated by commas. 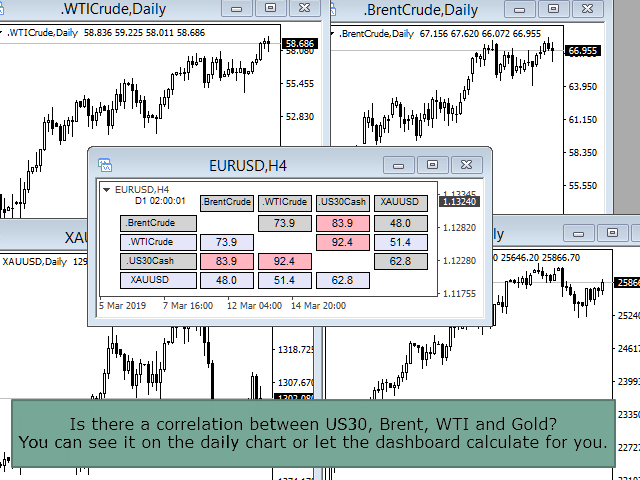 Please note that all selected UL are also marked as active in MT4. Otherwise, the Dashboard will not return values for this UL. If set to true here, the timeframe of the chart is used for the calculation. This setting is suitable for quick switching between the timeframes. 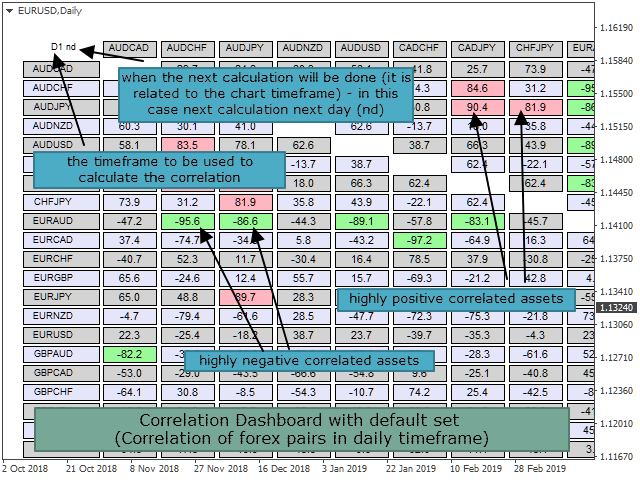 If false was set for "use chart timeframe", a timeframe can be specified here. This does not change if you change the chart timeframe. 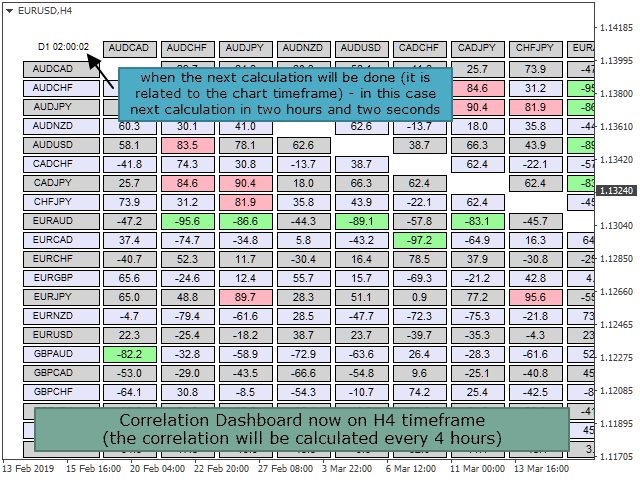 Here you set how many periods of the respective timeframe are used for the calculation. Set here the threshold from which a positively correlated pair is marked with a color. Set here the threshold from which a negatively correlated pair is marked with a color. Configure the dashboard the way you want it to be and how it fits on the screen. - display of "time remaining to next calculation"